1978 – It is one of the most infamous pictures in tech today. 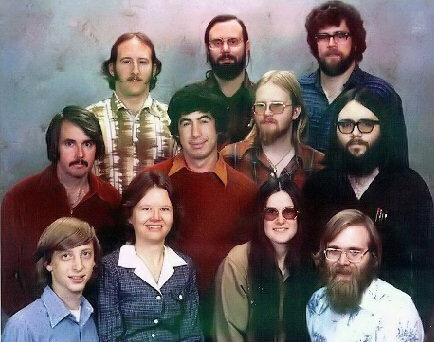 This is the Microsoft crew. Can you guess which one is Bill Gates? The picture was updated in 2008 when the group (except Bob Wallace, who passed away in 2002) got back together for Bill Gates last few days at Microsoft (below). 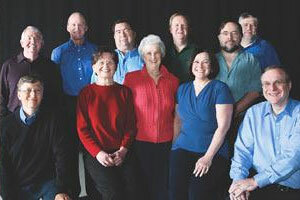 The staff picture includes: Bill Gates, Andrea Lewis, Marla Wood, Paul Allen (2nd row) Bob O’Rear, Bob Greenberg (who helped launch Cabbage Patch Kids), Marc McDonald, Gordon Letwin, (3rd row) Steve Wood, Bob Wallace (passed away in 2002) and Jim Lane.